Author Cheri Sicard explains why she created this course and what you can expect from it. Your Cannabis Cooking Problems Solved and Questions Answered! Are you confused by all the conflicting information out there about cooking with marijuana to the point you don’t know what to believe? Maybe you feel insecure about diving into cannabis cooking for fear of “doing it wrong,” or wasting cannabis by making edibles that fail to deliver what you need. Sadly, too many people write off edible cannabis, arguably the healthiest way to consume marijuana, as not working for them. But the truth is, most of these people would benefit and enjoy edibles, IF they consumed the right edibles for their individual needs. That’s where the beauty and value of making your own edibles comes in! Hi, I'm author, speaker, and cannabis educator Cheri Sicard. Armed with the lessons my Easy Cannabis Cooking for Home Cooks course, and with me as your cannabis cooking coach, you’ll be confident each time you make marijuana edibles that they’ll not only carry the dosage and effects you need, they’ll taste great too! I had gotten so much bad information from the internet, and I had wasted so much weed in trying to learn, I was ready to completely give up on cannabis cooking. Then I found your course and everything changed! Now I get the results I need every time. Thank you! The team at Cannademy and I just completed our second major upgrade since launching the Easy Cannabis Cooking for Home Cooks course about two years ago. Why did I want to add new classes to an already existing successful online course? Because the world of cannabis and cannabis edibles is not static, and I want you to be up to date. At least about topics that can practically help you in your home kitchen. I also realized from the number of emails and questions I was getting surrounding certain topics, that it was time to cover these subjects in more detail. So the new classes are based upon topics that my existing students have been asking about and either needed help with in the past, or were interested in adding to their existing cannabis cooking repertoires. Of course in addition to these new classes, the course also covers all the basics of cannabis cooking from the harvested plant to the finished dish on your plate. See the full curriculum below. The parts of the plant you can cook with and how to use them. Frugal tips for using every part of the plant. Understanding indicas, sativas, and hybrids and other strain considerations for cannabis cooking. The role of terpenes in cannabis’s effects. Understanding the maximum and minimum temperature parameters essential to quality THC and/or CBD edibles. Decarboxylation: why your edibles need it and how to do it. Easy ways for you to master the trickiest part of cannabis cooking: dosing. How to determine your personal ideal cannabis edibles dose. How to determine a reasonable amount marijuana to use for your needs. How to accurately estimate THC dosages even when using plant material or concentrates that have not been lab tested. How to use my dosage calculator tool to calculate the per-serving dosage of THC or CBD in any recipe you make. How to calculate edibles dosages when cooking cannabis concentrates like kief, hash, oils, FECO, etc. How improper decarboxylation affects potency, and what to do about it. What to do if you or someone you know eats too much marijuana. Five foolproof methods for making marijuana infusions, in both large and small batches, without special gadgets or butter making machines. How to infuse butter, coconut, olive and other oil, milk, cream, honey, syrup, and sugar with cannabis. How to cook directly with flowers. Easy to make alcohol and glycerin tinctures. Easy mess-free ways to drain and strain infusions. Understanding the role of lecithin in cannabis cooking. How to turn your personal favorite recipes into cannabis recipes. How to get the dose you need in adapted recipes. Practical ways to improve the flavor of your homemade edibles. Using terpenes for gourmet edible experiences along with maximum medical benefits. Practical considerations for anyone wanting to open a culinary cannabis business. Cheri Sicard has been transforming Southern California medical marijuana patients and home cooks into competent cannabis cooks during her live cooking classes for years. Now you can learn from Cheri no matter where you live, and on your schedule. A professional food writer long before she became a medical marijuana patient, it was only natural for Cheri to become a cannabis food writer and educator. Even though she was an experienced cook and food writer, little information about cannabis cooking was in print when Cheri began her journey into edible marijuana. She had to do a lot of experimenting and make a lot of mistakes along the way in order to figure out the easiest and most practical ways to make quality marijuana edibles. Fast-forward 20 plus years and Cheri is the author of 3 cannabis print books: The Easy Cannabis Cookbook (2018 Rockridge Press), Mary Jane: The Complete Marijuana Handbook for Women (2015, Seal Press) and The Cannabis Gourmet Cookbook (2012, Z-Dog Media). Her cannabis articles and recipes have appeared in countless magazines and newspapers including High Times, Freedom Leaf, Kitchen Toke, Civilized, The Cannafornian, and many, many, more. Cheri’s website www.CannabisCheri.com has evolved into an educational hub for cannabis and cannabis cooking enthusiasts, and Cheri has become the go-to media source for cannabis cooking and lifestyle stories. If you have an ordinary kitchen and basic cooking skills, you already have everything you need to become a successful cannabis cook…except possibly the knowledge. Until now. Sure you could spend a lot of time scouring the internet for information, and you could waste a lot of cannabis in the process of trying to separate the true cannabis chefs from the charlatans. And you can spend a lot of money on special gadgets that do an inferior job of making marijuana extractions and infusions. Or you could take this course and start making great edibles today. The Easy Cannabis Cooking for Home Cooks course breaks down the complicated subject of cannabis cooking into short easy-to follow lessons that you can watch anytime, from anywhere you have an internet connection. You also get author Cheri Sicard, one of the world’s foremost cannabis cooking authorities and the woman The Daily Beast called “the Martha Stewart of Weed,” as your personal cannabis cooking coach. Cheri’s information on dosing should be mandatory for anyone making their own edibles. What Can You Expect from the Easy Cannabis Cooking for Home Cooks Online Course? You can expect to always be confident when making cannabis edibles. After taking this course you’ll know how to medicate most any recipe you choose and have it come out tasting great. You'll get foolproof methods for making cannabis butter, oil, milk, cream, honey, syrup, sugar, and tincture. Best of all, you’ll master the trickiest part of cannabis cooking: proper dosing. You can expect to learn the secrets of cannabis cooking, including insider tips and tricks, from one of the world’s foremost cannabis cooking experts. Cheri Sicard‘s comprehensive online cannabis cooking course focuses exclusively on the needs of the home cook. The 2-plus hours of instructions are broken down into short, easy to digest lessons, most under 5 minutes long. You can access the course in the way that you learn best. Watch the lessons in order, or skip around to the parts you need when you need them. You'll also get digital notes, resources, and some awesome cannabis cookbook bonuses too (see below). If you have questions or concerns, Cheri is always here to help with advice and troubleshooting. It's like having a friend, who also happens to be a marijuana expert, you can email for advice anytime you need it. The best parts of the plant to cook with and where to find deals on it. How to get the dose you want when making homemade edibles. How to infuse marijuana into butter, olive oil, canola oil, coconut oil, milk, cream, vegan milks, honey, and syrups. Making marijuana infusions on the stovetop, in a slow cooker, in a double boiler, and in a Mason jar (no special marijuana butter making “gadgets” needed). The easy way to make cannabis tinctures. How to make cannabis infused sugar. How to cook with kief, hash and hash oils. How to “medicate” most any recipe you choose. Hundreds of tested cannabis recipes for all occasions. No more wasted marijuana. No more burnt batches of butter. No more over or under dosed edibles. Ever! Check out the ENTIRE course curriculum above. I love Cheri’s slow cooker infusion methods – easy to understand and always gets great results, and she is always available to answer questions via social media which is certainly an added bonus. Whenever you want it to! The course is completely self-paced - you decide when you start and when you finish. You can watch all the lessons in order, or skip around to the parts you need when you need them. You can watch the lessons over and over again. Once enrolled you get lifetime access, so you can learn cannabis cooking whenever it's convenient for you. How does lifetime access sound? After enrolling, you have unlimited access to this course for as long as you like - across any and all devices you own. You'll also automatically get any future revisions and upgrades at no charge. We would never want you to be unhappy! If you are unsatisfied with your purchase, contact us in the first 30 days and we will give you a full refund. That's right you have nothing to lose! If you have an ordinary kitchen with ordinary kitchen equipment, you already have everything you need. A slow cooker is nice, but not essential. Cheri is not a big believer in special equipment or unnecessary gadgets. Of course, it is assumed you have access to cannabis. Cheri is very accessible via email or her private Cannabis Cooking for Home Cooks Facebook group. Cheri is passionate about helping her students become better cannabis cooks. If you have questions, she will have the answers, and if she doesn't she will do her best to find out. Are there individual recipe demonstrations in the course? Cheri demonstrates how to cook with cannabis, so there are demonstrations of how to make marijuana butter and oil infusions using a number of different methods and techniques, and demonstrations of making kief. Once you have infusions and the basic principles of how to cook with marijuana down, such as proper temperatures, decarboxylation, and proper dosing, the rest is just cooking. So Cheri does not demonstrate individual recipes as it is assumed you already know how to cook. However nearly 200 tasty tested medicated recipes are included with this course. That’s not all. When you enroll in the course, you will also get lots of tasty, tested marijuana recipes. 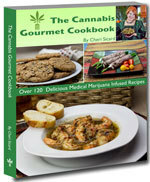 Not only will you get an autographed copy (the actual book) of Cheri's original Cannabis Gourmet Cookbook,* you’ll also get FREE digital downloads of Cannabis Gourmet Cookbook special edition e-books including: The original Cannabis Gourmet Cookbook, The Cannabis Gourmet Quick and Easy Cookbook, The Cannabis Gourmet Wake and Bake Cookbook, and the Cannabis Gourmet Vegan Cookbook. That’s a retail value of over $40.00! For the price of a single live cooking class, you get lifetime access to the course, the cookbook bonuses, and ongoing cannabis cooking education.